Welcome to our August Karen Burniston Designer Challenge. 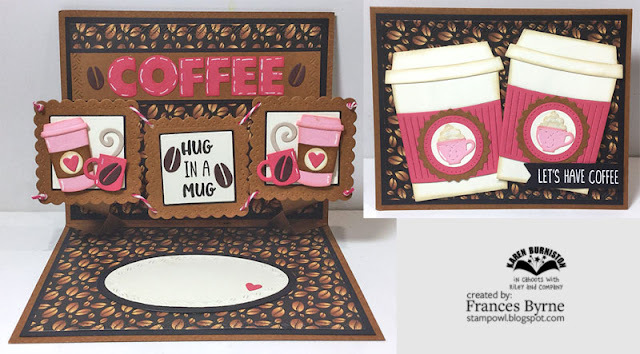 I decided to go with a coffee theme for the challenge today and used the Coffee Charms die set for the charm portion of the challenge. 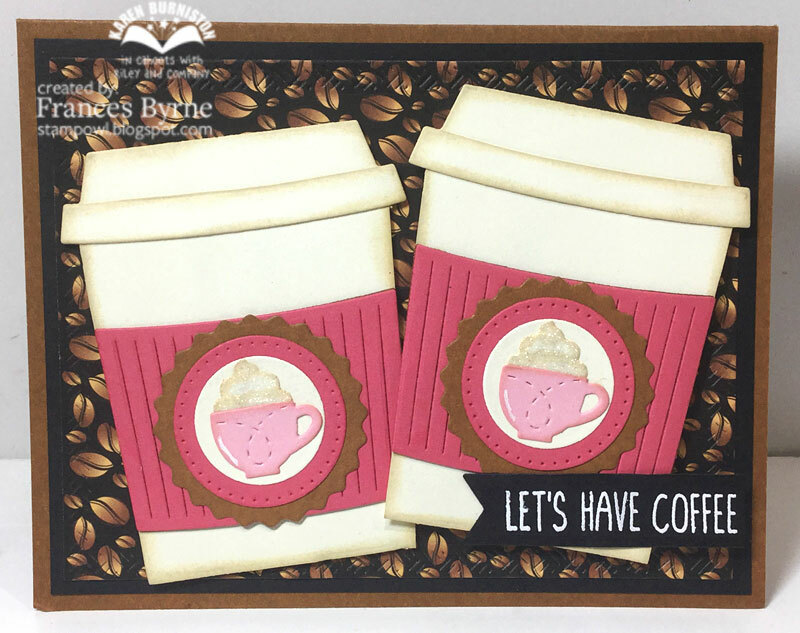 On the front of the card I created two coffee mugs using the Coffee Cup Pop-up die set. In the centre of the mugs I added the cup and cream from the Coffee Charms die set. 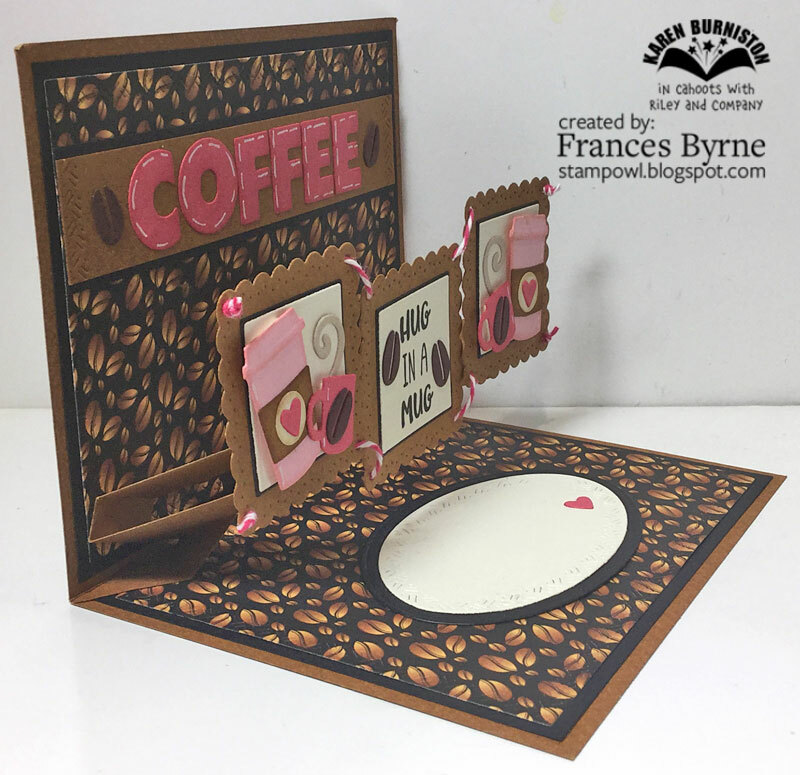 The coffee paper in the background was die cut using the largest die from the Crosshatch Rectangles die set. The sentiment is from Honey Bee Stamps and was embossed in white using the fishtail flag from the Upsy Daisy Pop-up die set. For the inside of the card I have created a pop-up card using the Upsy Daisy Pop-up die set. 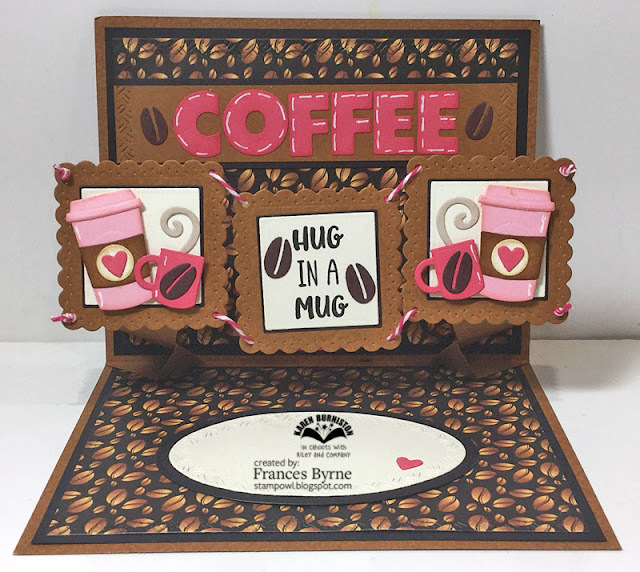 In the centre square of the pop-up I added a sentiment from Honey Bee Stamps and added two coffee beans from the Coffee Cup Pop-up die set. On the left and right squares I added coffee mugs from the Coffee Charms die set. The flourish in the small mug represents steam and is from the Cupcake Pop-up die set. I used the Alphabet die set to create the Coffee sentiment on the top panel of the card. I have again used the largest die from the Crosshatch Rectangles for the coffee bean designer paper. To finish the card I used the Crosshatch Ovals die set. This is a super cute card! I love all the detail, and the theme! The colors are very pleasing to the eye. Great card! Such a fun card ... I like your colour combo and the way you used the Alpha die too.